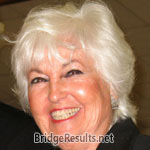 Freda Anderson and Bette Cornelius scored 0.82 masterpoints with a 54.86% game at La Jolla Beach and Tennis Bridge Club. See full results of this game. Jeremy Fields and Ying Lin Gu scored 2.10 masterpoints with a 57.69% game at ACBL Unit 539 - San Diego. See full results of this game. Cheryl Rodzach and Ginger Calvert scored 0.66 masterpoints with a 54.81% game at ACBL Unit 539 - San Diego. See full results of this game. 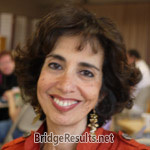 Lamya Agelidis and Lawrence Sherman scored 2.80 masterpoints with a 59.56% game at ACBL Unit 539 - San Diego. See full results of this game. Mary Hudson and Ramey Farah scored 1.12 masterpoints with a 55.42% game at ACBL Unit 539 - San Diego. See full results of this game. Freda Anderson and Bette Cornelius scored 1.36 masterpoints with a 59.87% game at La Jolla Beach and Tennis Bridge Club. See full results of this game.